Deep Trolling lures, these are a favourite lure for deep trolling in lakes, especially with copper wire. USA's biggest selling spinning lures, these come in a great range of colours, styles and sizes. Stainless Steel models are excellent saltwater and salmon lures. Casting into the future - a spinner for every situation. StrikePro have developed an innovative range of hard body lures for spinning and trolling, floating, sinking and suspending, articulated bodies, UV colours. 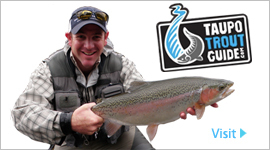 Deep Trolling and spinning, colours suitable for all New Zealand lakes, also great for spinning. Deep Trolling and spinning lures, Tasmanian Devils have long been the choice of New Zealand anglers with a great colour and size range. Spinning, Deep trolling - every New Zealand tackle box must have a Black Toby in it, and some great new colours now available. Obsession Lures are new to the market, but have quickly become a hit, very successful in all river situations. A new trout and salmon lure from Black Magic - this is different to anything you have seen before! We carry a range of single hooks fortrolling and spin fishing.